The essence of metaphor is to understand and experience one concept in terms of one another. For example, when we say, “argument is war”, we understand the concept of argument such that it has many similarities with war. We often use metaphor, but we may have underestimated the value and influence of it. George Lakoff and Mark Johnson, the authors of “Metaphors We Live by”, argued that our ordinary conceptual system, in terms of which we both think and act, is fundamentally metaphorical in nature. 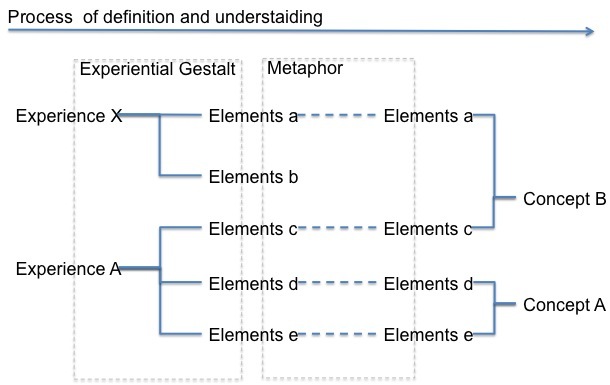 According to the authors, there are four types of metaphor. The first is structural metaphor, in which one concept is metaphorically structured in terms of another. Example: time is money. The second is orientational metaphor, by which one organizes a whole system of concepts with respect to one another. Example: happy is up / sad is down. The characteristic of orientational metaphor is that way of the orientation represents the culture. For instance, “happy is up” is based on the culture in which people associate “up” with something good. The third is ontological metaphor. In this metaphor, a concept is understood as entity or human beings. For instance, when we say “this recession is killing me”, we are personifying the recession. The fourth is new metaphor. This is a metaphor that we personally find particularly forceful, insightful, and appropriate, given our experiences as members of our generation and our culture. For instance “love is a collaborative work of art” is the one. Many maxims are new metaphor. Every conceptual system has grounding, structure, relation among concepts, and definition. The authors claim that our conceptual system is based on metaphorical reasoning. Let me show how it goes. In Prof. Lakoff and Johnson’s perspective, experience is the ground. Every understanding and reasoning starts with it. These gestalts play important role in coming up with metaphor. When we make a metaphor, we use some elements in gestalts of our experience. For instance, in the “argument is war” metaphor, the gestalt for conversation is structured further by means of correspondences with selected elements of the gestalt for war. 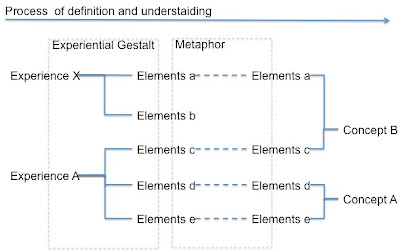 In this way, by using elements of the gestalts as a bridge, we understand one concept using our experience, and that is the metaphorical process of concept structuring. Thus, according to the authors, the concept of definition is more vague than we usually think. They argued that we can only define and understand a concept metaphorically, i.e. we understand it primarily in terms of concepts for other natural kinds of experiences. Logical conclusion of the authors’ argument is to deny the universal truth or concept. They say, “ we do not believe that there is such a thing as objective truth, though it has been a long-standing theme in Western culture that there is.” (page 159) In their perspective, reasoning is based on one’s experience, which is very specific and varied among individuals. Everyone has different experience, and especially in the case that we communicate with those who have totally different background, it is extremely difficult to share objective and universal principle. Although the authors deny the objectivism and spent a lot of pages attacking the notion, I still believe that there could be a few universal and objective values that all human beings can share as a common sense. Granted, the scope of the common sense could be very narrow, but such fundamental things as valuing life and love could form the basis of universal principles. Their argument reminds me of what my father had done for me when I was a child. Although I was raised in a financially challenged family, my father took my brothers and me to many places, seas, mountains, museums, etc. Those experiences may have expanded elements of the gestalts, thus leading to development of my intelligence. The theory also makes me to understand why people understand one situation very differently. That difference may be coming from the difference of experiences, and the way to expand and develop understanding of others, the key would be experience the things as much as one can.